This piece was originally published on NYU Local, the independent news blog of NYU. It was re-posted here with permission. Last year, Occupy Wall Street was making headlines at NYU. We saw infamous walk-outs, elaborate and ridiculous drama over students visiting the protestors, and an episode of presidential back-talk never seen before. Now, a new group of activists is looking to NYU President John Sexton in a movement that has the makings and spirit of a young Occupy. 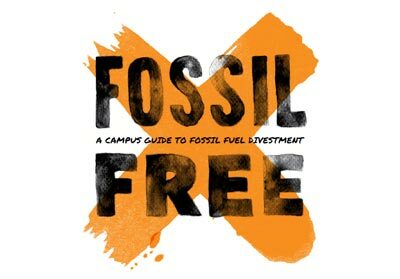 NYU Divest: Go Fossil Free!, a coalition of students, faculty, and alumni looking to end the university’s investments in fossil fuel companies, has been gaining momentum on campus. With the tagline, ‘President Sexton, Go Fossil Free!’ it is clear that the group is eyeing large-scale change directly from members of the administration. Divest NYU has many ties with OWS activists, and considers itself a subscriber in much of Occupy’s greater philosophy. The crusade is a local offshoot of a larger movement founded by Bill McKibben, activist, prolific author, and eco-celebrity who established 350.org, an organization working to end American dependence on and emissions from fossil fuels. A few weeks ago, hundreds crammed into the Hammerstein ballroom on 34th Street to hear McKibben speak. The ballroom, which is more often packed with fans of Nicki Minaj and Eminem, was filled to the brim. Beneath the ornate sloped arches of the 12,000-square-foot venue, the audience cheered, danced, laughed and chanted. But they weren’t there to see Drake or even the annual NASCAR award (which have, strangely, been held there). The room was instead packed with activists, students, scientists, and environmentally concerned folk in general—all to support a cause whose supporters are nearly as passionate as J. Biebs (maybe). They were cheering and shouting for climate advocacy, and Bill McKibben was their rock star. McKibben has lately been gaining global recognition for his 350.org campaign. The effort aims to reduce carbon emissions globally and bring the concentration of carbon dioxide in the atmosphere down to 350 parts per million—the number that renowned NASA climate expert James Hansen has declared a safe upper limit to avoid irreversible effects induced by climate change. 350.org and McKibben’s ‘Do The Math’ tour, which recently wrapped after a 21-city journey, focuses on the need to target the fossil fuel industry in order to have real impact on the problem of climate change. 350.org has of late called on colleges and universities, who hold over $400 billion nationwide in endowments, to be the leaders in the plea for divestment. NYU, which has an endowment of $2.8 billion, has been one of the first victims of the impacts of climate change on a large scale, after Hurricane Sandy left thousands of students without electricity and heat and cancelled classes for a week. “You all should not have had to go through what you went through with Sandy,” said McKibben, who postulated that the disaster might have been the ‘wake-up call’ that New Yorkers needed. With NYU Divest gaining traction on campus, it remains to be seen whether the university will respond to the call.